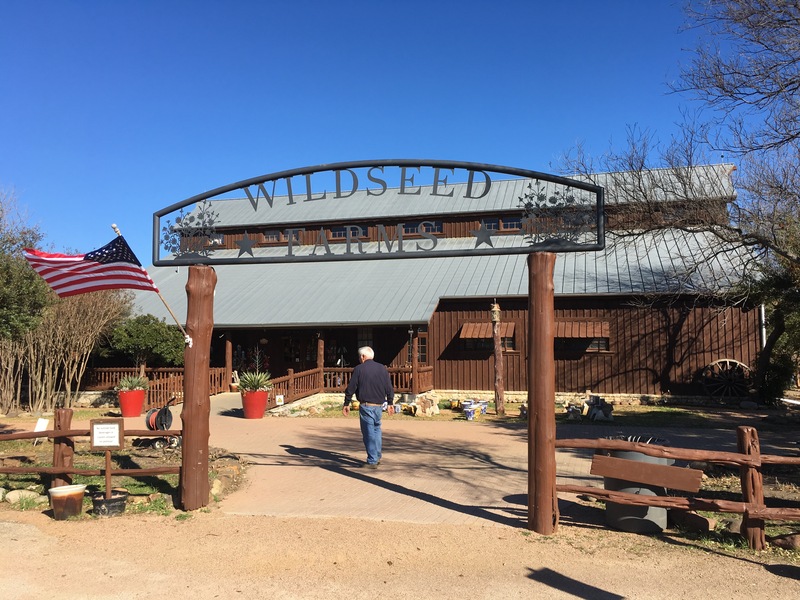 Fredericksburg Texas – Let's Go RVing! Jerry had said that he wanted to leave by 8:00 so I got up and attem’ early and by golly we were on the road at 8:08! It was a miracle! Boy, we are on a roll. Up and on our way out of Holiday Park COE at Benbrook by 8:08! It was an easy drive although some of the highway was a little rough and we did run into road construction which slowed us down a bit. We stopped in Lampasas for gas and pulled up beside an Allegro. As the gas was pumping I chatted with the lady and she told me she was full time and just traveled around Texas due to a heart condition. Apparently her husband had died and she was alone She said someone had advised her to sell her coach after 5 years if she full timed in it and buy a new one. She didn’t listen and this past year had been a repair year. She drove that rig out of the gas station like a pro. I’ve got a lot to learn! We arrived at 1:00, got checked in quickly and then got set up. Since we had been without septic for three days Jerry went on and emptied all of the tanks so set up took a bit longer than usual. After a quick lunch we left for a bit a touring. Our first stop was at Becker Wines where they not only make wine but also grow lavender. We were only there a few minutes as we weren’t interested in doing a tasting. Our next stop was a metal design business. We have been looking for a sun to put on the outside of the river house and Jerry was hoping that he might find one there. He didn’t. Actually we have seen one we like in Johnson City but they haven’t been opened either time we went! Moving on down the highway we stopped at Wildseed Farms. What a fascinating gift shop full of seeds for many different flowers plus many little items that would make wonderful keepsakes and gifts. They even had a little clothes section and yes, I did see something I liked but no, I didn’t buy it. Our next stop was at Circle E Candles. After circling the store twice and smelling many different candles we finally decided to get a Eucalyptus. It does smell good. We discussed going to Luckenburg but decided to wait to do that tomorrow. We went into Fredericksburg, parked and ambled up and down the streets and in and out of various shops finally ending up at the Candy Store where we finally got some ice cream! We ended the afternoon by finding the restaurant that we were planning to eat at later tonight and then went on back to the coach for a little rest! Yep, we never made it to the restaurant deciding instead of just have a sandwich for dinner. Maybe tomorrow evening. As we were preparing to leave Braunig RV Resort I noticed another Canyon Star parked a couple of sites down so surely I had to talk to them and ask them about their coach. It is their first coach and the guy said their only one as he would never get that one paid off! They are from the Austin area and apparently on go on short trips but really like their motor home. We got a late start to Fredericksburg but after we got out of San Antonio traffic it wasn’t a bad drive and it was less than 100 miles. 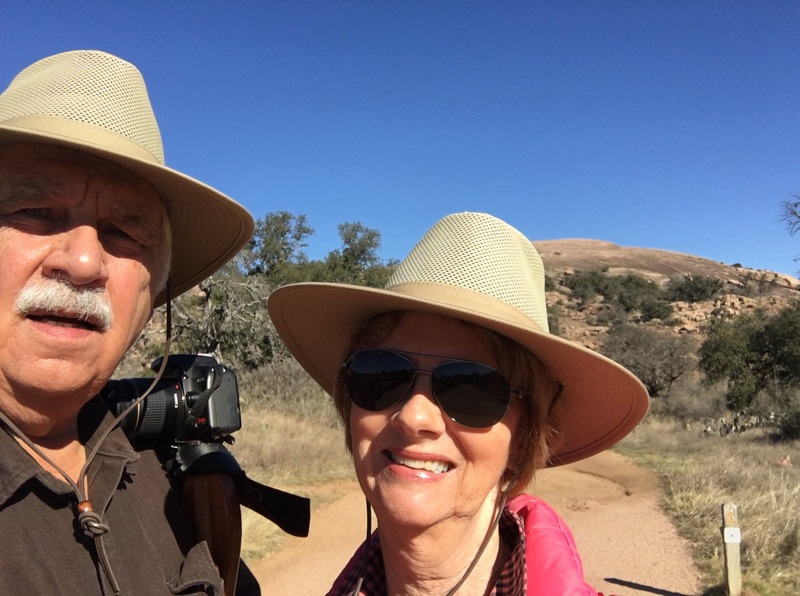 We quickly settled into the Lady Bird Memorial RV Park and it is quite a nice park although we are parked right next to an air strip with small planes taking off and landing frequently during the day. It’s the first park we’ve ever been in that parks RV’s opposite on each site. In other words, our neighbor’s door and our door opened toward each other. It really was quite nice! 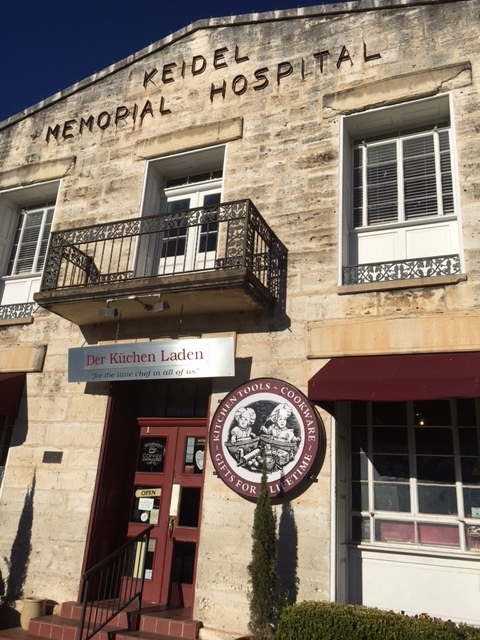 After lunch we headed to the Enchanted Rock, the main draw in bringing us to Fredericksburg. As we were riding along I suddenly saw a sign that said the park was closed when the lights were flashing and they were flashing! Dang. We found out that it was closed for three days for Youth Hunt. This is when they go in to cull the deer herd as they are so populous in the area. I was so disappointed but what can you do. We turned around and rode back into Fredericksburg and went to the National Museum of the War in the Pacific. This place is so large that you get a three day pass with your entrance ticket. Unfortunately we only saw a small part of it centering on the conflict between China and Japan and the events leading up to the war. 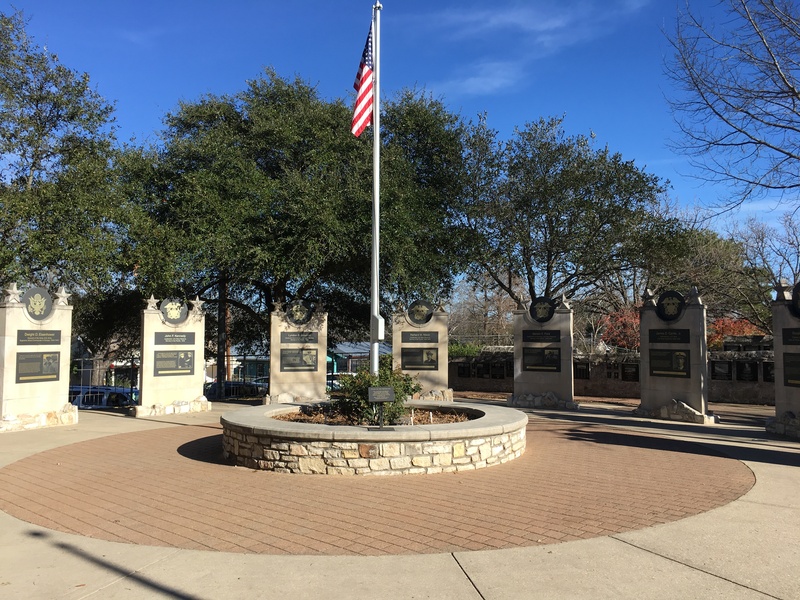 In an outside courtyard they have the Plaza of the Presidents where they have monuments for each of the presidents who served as Commander in Chief during the world wars. I was amazed to see that the majority of them had been active servicemen at some time. It is a rather daunting place full of heroes, memories, triumph and tragedy. I kept thinking of my daddy as he served in World War II on the Seawolf. I remember calling it a boat and he quickly told me that it was a ship and the smallest ship to go overseas on its own power. We owe our servicemen and women so very much, our very freedom. About 3:00 Jerry hit a wall and I was not far behind him so we came on back to the campground after a trip to the local grocery store. When we returned we sat outside and talked with the neighbors a bit as Jerry grilled pork chops and I took a quick 10 minute ride on the bike. Our neighbors are true bikers – they rode their bikes from Seattle, Washington to Portland, Maine in 60 days! Wow! He owns a bike shop. 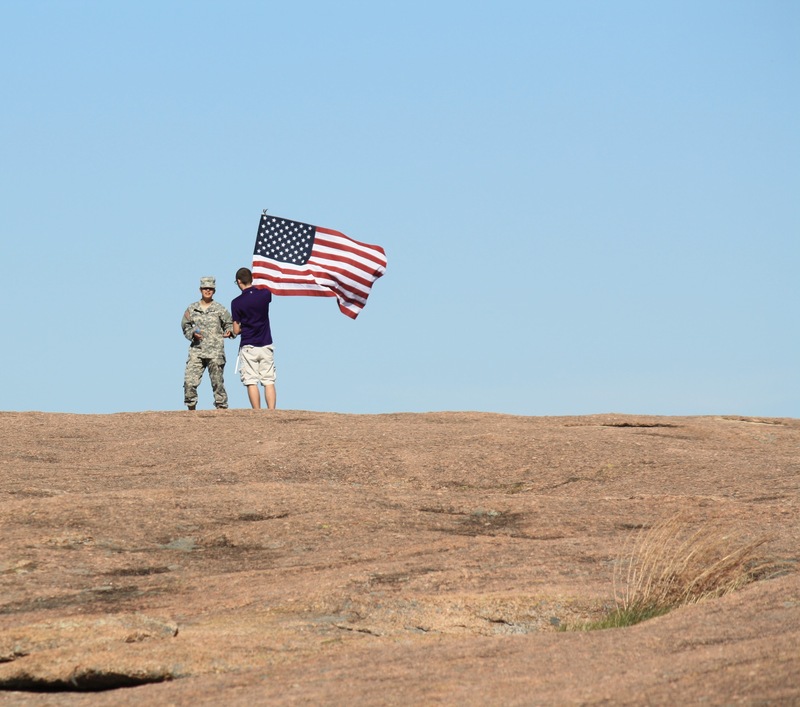 After some discussion Jerry and I decided to change our itinerary so that we could come back through Fredericksburg to see the Enchanted Rock. It will mean calling several campgrounds to reschedule our arrival but I’ll work on it. Another state park we wanted to see, Caprock is going to be closed during the time we had originally planned to be there so by doing this we’ll be able to see that one too. Oh, they have a Youth Hunt day there too. There must be a lot of deer running and around here!